This article was first published in Picture House magazine in the Summer of 1998. This is the story of one of Scotland's most important independent cinema circuits and of its owner, George Palmer. The soaring, neon-lit, tiled frontage of the George Cinema was a sight to behold among the dour sooty terraces of Bellshill’s Main Street. I remember the George only during its final years in the early 1980s. Although just a wee boy, I was deeply impressed by its cavernous dark pink interior with dim light glowing from behind coves in the ceiling and intricate grilles on either side of the vast screen. Only the balcony was then in use and, even at a Christmas showing of Snow-White, I never saw more than a couple of dozen customers. By then the George was being run on a day-to-day basis by a bingo outfit who were only waiting for a license. It was never granted and the George closed abruptly in May 1982 for demolition. Years later I became a student at Glasgow School of Art and began to take an interest in Scotland’s fast disappearing cinema buildings. Looking back, it was perhaps my few visits to the George that started this fascination. George Palmer was born in 1903 in Govan, a burgh of Glasgow famed for its engineering and shipyards. He went to Govan High School and later to Glasgow Technical College, before joining Fairfields Shipyard as an electrical engineer. He lived in a cinema-mad neighbourhood where as many as fifteen different picture houses competed for business. 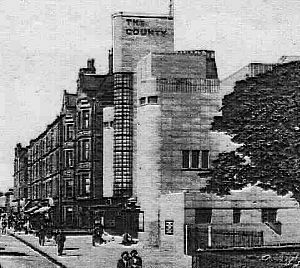 In 1922 Palmer left his job at Fairfields to manage a local picture house (possibly the Govan Cinema in Maxwell’s ABC circuit). His enthusiastic promotion of films brought him to the attention of the CEA Scottish Branch with an award for showmanship. After a year, he was appointed general manager of the prestigious first run La Scala in Glasgow’s Sauchiehall Street, an amazing achievement for a mere twenty year old. Alhambra In 1925, he moved with his wife and young daughter, Madge, to Bellshill, becoming manager of the Alhambra on the town’s Main Street. Notwithstanding its idyllic name, Bellshill was in fact a grim mining village with a population of 20,000 in its environs at the heart of the Lanarkshire coal field. Opened in 1923 by a local syndicate including Mr Antonio Verrecchia, who ran the neighbouring ice cream parlour, the Alhambra had been struggling. Palmer set about winning audiences back from the rival Picture House by booking the best available films (during his brief spell at La Scala, he had made many useful acquaintances in the CEA and could often get new releases before the opposition). In March 1929, the Alhambra became the first cinema in Lanarkshire to fit talkie equipment (supplied by Western Electric) and Jolson’s The Jazz Singer opened there immediately after its record-breaking Glasgow run at the Coliseum. After seven years as manager, Palmer became managing director of the Alhambra in March 1932. In May 1937, Palmer acquired the Regal in Mossend, a linear mining village a couple of miles to the east of Bellshill . This was a conversion from the old Pavilion Theatre of Varieties, dating from 1912. Although the area was suffering from the effects of the depression, Palmer spent £4000 on refurbishment, including a new neon name sign on the frontage. At the opening, he was presented with a leather dressing case by Bill McGee, the Regal’s manager, who was to become one of Palmer’s most loyal employees as he built up his circuit during the following years. In 1938, the Alhambra was rebuilt and opened on 16 September. The Bellshill Speaker described it as ‘Lanarkshire’s New Wonder Cinema’ and explained how ‘Mr Palmer fully intends to bring London West End discipline into the Alhambra, which indicates that noise and drunkenness will not be tolerated. A rule that will be strictly enforced is that children in arms will not be admitted…’ The exterior was fitted with a full length canopy and a fin-shaped name sign, both with red and green neon. It made the Alhambra a landmark which could be seen from as far away as the platform of Mossend Station. The foyer had terrazzo floors, marble dados and an island pay box below a domed ceiling. The screen had two sets of curtains in crimson velvet over silver and gold silk screen tabs with French pleating. On the technical side, there was a new installation of Western Electric Mirrophoric sound apparatus (another first for the area). Odeon Leicester Square In 1938, George Palmer went on a CEA trip to London to view the new Odeon Leicester Square. The Lanarkshire upstart must have been impressed, for on his return, he bought a large vacant site next to Bellshill Academy to construct what he described to the Speaker as ‘Lanarkshire’s answer to the London Odeon.’ The site was to have been developed as the State cinema by another local showman, but Palmer’s ambitious project did not get beyond the erection of steel frames when war was declared and all construction work on cinemas was halted. It would be another 14 years before his flagship project would open, and in the meantime, Associated G.P. Cinemas would expand all over the Central Belt of Scotland. In 1940, Palmer was looking for fresh screens to conquer, but buying cinemas was a risky business then. He bought the Palace in Clydebank only weeks before it took a direct hit from a land mine in the Clydebank blitz. That hall had begun life as a variety theatre and was an original member of Maxwell’s ABC chain. Fortunately the audience had left for air raid shelters when the cinema was hit, although it was a write-off. Its proud new owner was unlucky to buy the only Scottish cinema damaged by enemy action. Undaunted, in 1942, Palmer more than doubled the size of his operation when he bought first the Pavilion cinema on the corner of Crofthead Street and Spindlelowe Road in Uddingston, in the shadow of the town’s main employer, the Tunnock’s bakery. The 850-seat Pavilion was a small and little-known ‘atmospheric’, designed by Albert Gardner and opened in August 1920. It was then described as ‘picturesque in the extreme and oriental in appearance.’ His other acquisition was far away from home (Palmer by then lived in Uddingston) in Portobello, a seaside resort on the Forth estuary which had been absorbed into Edinburgh. The Bungalow Electric Theatre dated from some time before 1902, being described in licensing documents simply as ‘a hall with lavatories.’ It was a roller skating venue in 1910-11 before Wilbur Harlan, an American showman converted it to the Bungalow Electric Cinema. Portobello was then a great mecca for Edinburgh holiday makers; it had Scotland’s only seaside pier, several variety theatres and an amusement park with Winter Gardens and a Bostock menagerie, known as the Marine Gardens. The Bungalow was a rudimentary cinema with wooden forms in the front rows of a gas-lit single level auditorium with bare roof trusses. As Portobello’s Marine Gardens had been occupied by the Admiralty and there was a strong military presence, he re-named it the Victory. Central "I grew up with the Central and can claim to have been chucked out of it many times into Hope Lane behind. During children’s matinees, the management used the imaginative ploy of throwing out unruly juveniles by the row. The manager would come down the aisle with two doormen and order ‘third row out, NOW!’ which must have been good for business, as many of us promptly paid for re-entry….George Palmer sometimes came in person to collect the takings. We knew of him as his portrait hung in the foyer of both his cinemas and everything from tickets to carpets had the G.P. symbol." The Victory closed in May 1956 having shared programmes with the George during its final years as an ‘overflow’ venue. When Palmer bought the luxurious County in Bath Street in 1955, it took the circuit name and the High Street George reverted to being known as the New Central until it closed on 2 December 1961 in favour of bingo. After years as a cabaret ‘nitespot’, it is now derelict [2006 update: Now flats]. The Victory is a furniture store [2006 update: Now demolished]. In May 1943, Palmer added the Picturedrome in Edinburgh’s Easter Road to his expanding empire when the original owner, Alex Black, died. The Picturedrome dated from September 1912 and seated 600 in a florid Edwardian-style auditorium in the back court of a row of tenements. The entrances to the front and rear sections were cramped between shops, however it was reputedly a good earner and was refurbished as the Eastway. Palmer increased the Eastway’s capacity to 875 by extending the auditorium and it continued until 26 August 1961. Its manager, Freddie Gardner, supervised all Palmer’s cinemas in the Edinburgh area. The cinema became a supermarket and fragments of the original interior are reputedly still visible above what is now a branch of Iceland. Norwood In 1944, Palmer bought the Norwood near Charing Cross in Glasgow’s city centre from the notorious showman and cinema pioneer, A.E. Pickard. Pickard had converted it in 1936 from the Norwood ballroom. The structure consisted of an asbestos roof, supported on either side by existing buildings. True to form, its original promoter had devised an outlandish frontage topped with two cantilevers of the Forth Railway Bridge, a clock suspended between them and a big plywood replica of the Cunard liner Queen Mary sailing underneath as a Bassett-Lowke model locomotive crossed the bridge! Hard though it is to imagine, the interior was even more curious with a display case containing a Kilmarnock edition of Burns poetry marked as ‘A Gift for Whichever Leader Wins the War.’ The stadium auditorium was clad in faceted mirrors of different colours with a specially woven carpet glued to the ceiling - no wonder it was known as ‘Pickard’s Crystal Palace’. The reflections caused by the mirrors must have made watching a film at the Norwood very difficult! When the necessary building permits were obtained, Palmer had the Norwood rebuilt. There was a Gala opening on 14 August 1950 when the cinema was opened by the Lord Provost of Glasgow as the George. Palmer’s usual architect, Lennox Paterson from Hamilton, had toned down the interior, but the bridge remained until ABC took over in December 1955. The building is now a snooker club. On 4 May 1945, Palmer opened another Victory Cinema, this time on Dumbarton Road in the Whiteinch area of Glasgow. As with its Edinburgh namesake, this was yet another venerable hall, dating from 1913. It had started life as the Avenue, with films interspersed by music hall ‘turns’, although the stage was only a few planks wide. It was designed by Thomas Baird Jnr with a flamboyant frontage in French Empire style with two steeply pitched pavilion roofs, but this appeared to have been tacked onto the most rudimentary hall behind. Palmer bought the Victory from the showman James Graham and after extensive refurbishment was carried out by Modernisation Ltd (a firm which inexpensively did to cinemas exactly what its name implied), it soldiered on until 1964. It then became a warehouse until demolition in the 1980s. Palmer’s various cinema interests were brought together when he formed Associated G.P. Cinemas in 1946 with an office at 149 West George Street in Glasgow. Its two directors were George Palmer and his second wife, Janet, reputedly a formidable lady, who was the driving force behind the firm’s continued expansion. That year he lost his pioneering Regal in Mossend to an overnight fire (Scottish cinemas burned down with unfailing regularity, perhaps because, especially in industrial areas, their patrons have always shown a macho disdain for the use of ash trays). Rialto A new addition was the Largs Picture House, a little 700 seater in the popular Clyde Coast resort town. Largs was a favourite holiday destination for the Palmers and the cinema, which dated from 1913, became the George. Later, that December, Palmer bought the Rialto in Cathcart on Glasgow’s south side from ABC, which was already well represented in the area. This too was modernised, becoming the George on 23 December 1948. By the late forties, Associated G.P. Cinemas had become a large circuit, but although well maintained, the cinemas were a rickety bunch, mostly dating from the era of silent films. This situation was soon to change. In April 1946 Palmer bought the Ayrshire-based K.R. Blair cinema Circuit in what was then the biggest post-war cinema deal in Scotland. The Blair chain included the Regal in Girvan, the Palace in Irvine, the Picture House in Beith, the Kyle in Irvine and the Embassy in Troon. The latter two each seated over 1,500 and were among the most modern cinemas in Scotland. 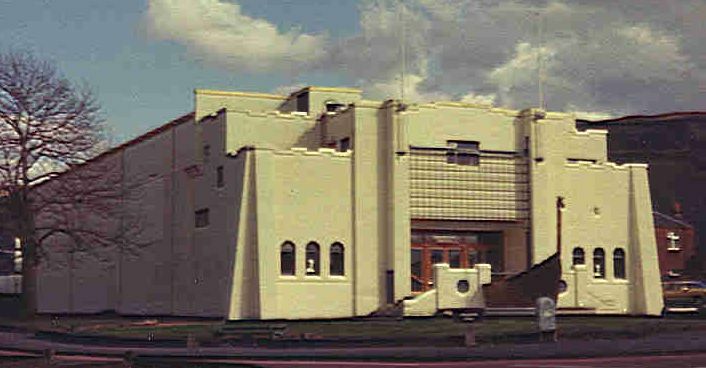 The Embassy was built in 1937 to a James McKissack design. McKissack was one of Scotland’s most prolific cinema specialists and it had a cloud-shaped facade in cream and blue tiles incorporating a display panel for the current attractions and shop units on either side. The auditorium behind was spacious with curving grilles flanking the screen and decorative back-lit fountain motifs on the splay walls with cove lighting above. The Kyle and the Regal were also McKissack-designed thirties ‘supers’ and all three were soon re-named George. In the autumn of 1946 negotiations began with the Bridgend Picture House company to take over its four cinemas in Largs and Kilbirnie in Ayrshire. These concluded with a take-over by George Palmer in 1948. 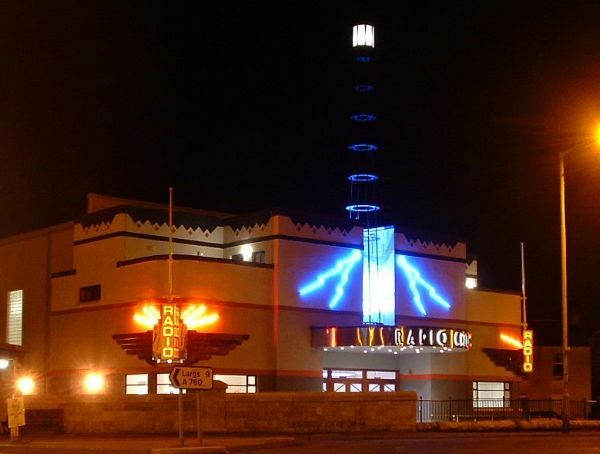 One of its directors was the Kilbirnie-based architect James Houston, responsible for the design of the two most flamboyant cinemas in the deal, the Radio and the Viking. 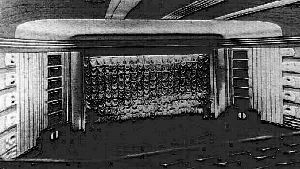 The Radio was built in 1937 and, as with the somewhat better known Radio City Music Hall in New York City, took the mircale of electronic communication as its theme. It had a low, curvaceous white frontage with red and silver stripes, chrome eagle’s heads with wings at each corner and a mighty fake radio beacon soaring above the entrance with a flashing light and flashing purple neon zig-zags to broadcast its presence to the neighbourhood. Bearing in mind that the Radio stood at a cross roads in a staid little Ayrshire village of sandstone terraces and villas, this design was more than a little audacious! The foyer had a swirling terrazzo and mosaic floor which continued the theme of radio waves and the proscenium in its stadium auditorium was equally futuristic. The Viking was also themed, this time taking its inspiration from the Battle of Largs where the Scots trounced Viking invaders in 1263. It opened on 31 October 1939, ironically the day before another battle commenced as the Germans invaded Danzig. The Viking was a tour de force; it stood in landscaped gardens on the waterfront where a replica Viking long boat projected from the entrance. Patrons entered between buttressed walls beneath battlements and a portcullis which advertised the cinema’s programme and shut over the doors for security at night. The whole confection was painted in red, white and blue and there were murals showing scenes of the battle in the auditorium. Houston’s two cinemas were not only highly original, but also very convincingly designed. The other Largs cinema in the deal was the Electric Picture Pavilion, dating from 1911 and located up a side street next to the Gogo Water. Being tiny, badly appointed and remote from the town centre, it was sold to become the Star Ballroom in 1952, although miraculously it still exists. 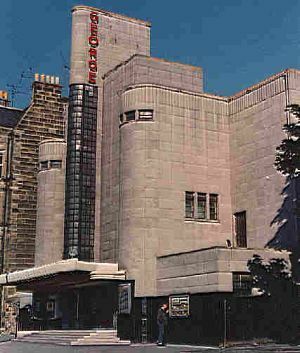 The last of the four was the Kilbirnie Picture House of 1922 which became the George for a time until it closed in 1959 and the Radio was given the circuit name. In May 1948, Associated G.P. Cinemas took over the Crown in Crown Street in the Gorbals - a densely packed area of slum tenement housing in Glasgow’s inner city. 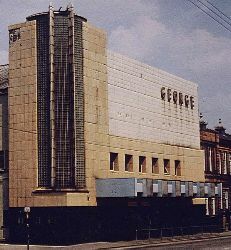 This 1930-vintage cinema, designed by Lennox and McMath, became yet another George and was one of the circuit’s busiest cinemas during the 1950s as it took the Rank release immediately after it had played in the city centre. It soldiered on until 1970 when its patrons were moved elsewhere by the city authorities to allow the much-needed comprehensive redevelopment of Gorbals to begin. On 24 November 1951 the George in Bellshill finally opened. Palmer’s dream-child and circuit flagship had been fourteen years in the making, but after much lobbying of the Atlee government by the all-powerful National Union of Mineworkers Lanarkshire Branch, the building permits were finally granted in 1948, although materials shortages had delayed completion by several more years. For Palmer, it was a triumph; the first brand new post war cinema anywhere in Britain and one of such high quality as to compete favourably with most city centre houses. The Ideal Kinema hailed it as ‘Scotland’s Contribution to Kinema Loveliness’ and ‘a Triumph of Beauty and Comfort’. The George had been designed by Lennox Paterson, and although the basic planning was pre-war, the latest thinking was employed in its execution. The exterior was a startling addition to the grimy streets of Bellshill, being clad entirely in cream, biscuit and black tiles with an internally-lit tower of glass block work at one end. The frontage was outlined in pink, red and blue neon with sixteen banks of white tubes under the canopy. In 1954 with business booming, in an era still without mass access to television, Palmer bought another top class super cinema, this time in Portobello. The County was a striking moderne design by T.Bowhill, Gibson and Laing and had opened in March 1939 for Henry Paulo and Robert Scott (the former was of fairground origin and the latter was a local businessman). The County had a sumptous interior, although the balcony lounge in rich red tartan was perhaps not to everyone’s taste! Palmer intended that his latest acquisition should be a venue for Edinburgh Film Festival screenings, so it was refurbished to a high standard and, inevitably, re-named the George. 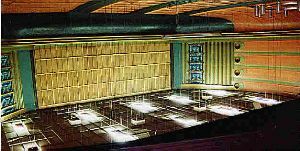 It too was given tropical fish curtains, the ‘GP’ carpet, stereo sound equipment (the first Edinburgh cinema so fitted) and a re-styled lounge with a mirrored wall etched with a panoramic view of the River Forth. Its fine technical appointments secured an early showing of The Robe and each Festival season, it switched to continental films. The era of the super cinema, particularly in provincial areas, was drawing to a close with the advent of colour television. Even so, George Palmer correctly believed that people would still want to go out to the cinema for romance and spectacle in their entertainment. In February 1969, when his fine George cinema in Irvine burned down, he refurbished the smaller, older Palace in nearby Chapel Lane and it became a replacement George. It was only a stop-gap as the site was compulsorily purchased by the Irvine Development Corporation (Irvine had been granted new town status) for an office development. Later, Palmer took a lease on the abandoned Rex in Bank Street, a venerable hall that had once been a Green’s Picturedrome of the famous George Green chain. He spent £100,000 rebuilding it as the latest George with a modern stadium-type interior with wall-to-wall curtaining in gold. It opened in January 1976. In 1969, Palmer bought the derelict Pavilion in Barrhead, near Paisley, for £80,000. It was a 1,009 seater dating from the 1920s and it was refurbished, opening as the George on 11 April 1969 with Disney’s The Jungle Book. The intention was to attract family audiences, but it was not a success and closed in December 1977. Although Palmer offered it for sale to the local Arts Guild for just £30,000, nothing came of the deal and the George was demolished instead. Sadly, in the same period, the rest of Palmer’s cinemas closed one by one. The Viking in Largs, which had been part of the seaside resort’s magic for countless holidaymakers, shut on 4 August 1973 and was sold to local restaurateurs as a drinks bottling warehouse, although it has now been demolished. The flagship Georges in Bellshill and Portobello were both sold for bingo, the former to County Properties, whose owners were related to the original promoters of the Portobello cinema. The George in Bellshill continued as a cinema as repeated applications for a bingo license were refused. No money was spent on maintenance and it finally closed in 1982 for demolition. Its Portobello namesake went over to bingo, but despite grade B listed status, its interior has been carved up and its tower chopped down. The Radio in Kilbirnie lost its transmitter mast as a bingo hall and it now lies derelict. 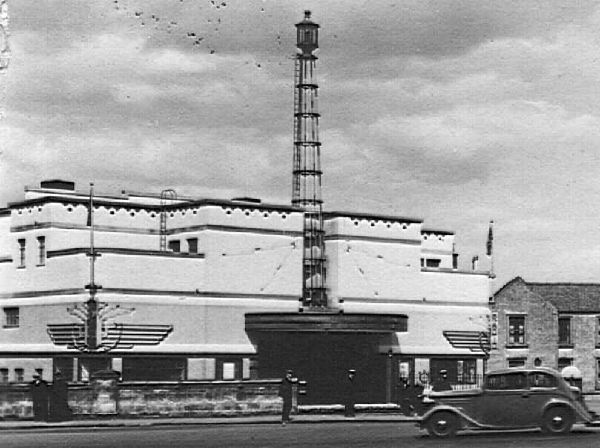 The Regal in Girvan became a Vogue bingo hall and the rest were redeveloped. George Palmer died in 1980, leaving his widow, Janet, to wind down the business. The two remaining cinemas were the Georges in Beith and Irvine, both in Ayrshire (the Palmers had retired to Largs where they had planned to open another cinema). George / WMR Irvine The Beith cinema was put up for sale in the autumn of 1982, but a surprisingly good run of E.T. over the Christmas period helped keep it open until the following summer. It finally closed on 25 June 1983 for conversion to a snooker club, although the building has since been demolished. The George in Irvine was sold at the same time to William Mather, the former boss of a leisure group called Fairworld, and re-christened the WMR Film Centre. It is the only one of George Palmer’s cinemas still showing movies today [2006 update: Now a nightclub].